May we serve you too ? All our printing, is done in-house on high-definition printers. We also have a graphic design team who collaborate with you for the optimum design for your displays. Trade show display showroom : We have a 2000sq foot trade show display equipment showroom. 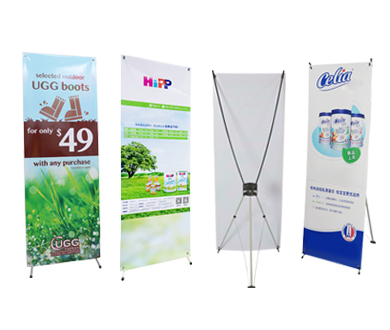 View our complete range of portable display solutions, including Retractable Banners,Pop Up Displays, Displays Flags Banner, Promotional Counters, Canopy Tent and trade show accessories. Price promise : We are the real factory, not the middle man, so We work to offer very competitive prices on the best displays. If you see cheaper display product prices elsewhere, ask why? How are the graphics printed? What inks are used? What material is the stand made from? Will the graphics have a good fit? We have wide-format, inkjet printers in-house, and offer emergency wide format printing services to our clients. We can print banner stands, convention signs, adhesive vinyl banners, and signs in 24 hours if needed! 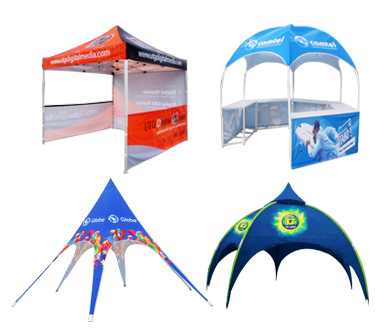 Tents & Canopies Our outdoor canopies & tents for events and instant pop up custom outdoor canopies come with a selection of accessories to suit your event. 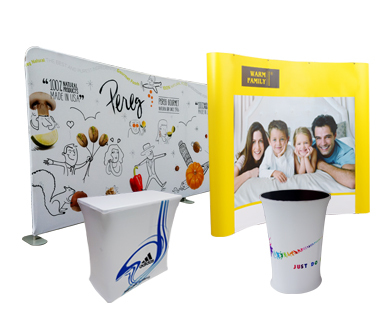 Pop up displays all share one characteristic – they ALL have an expanding accordion frame. These accordion frames use either “carpet” panels or printed lambda mural graphic panels or dye sub printed fabric panels. 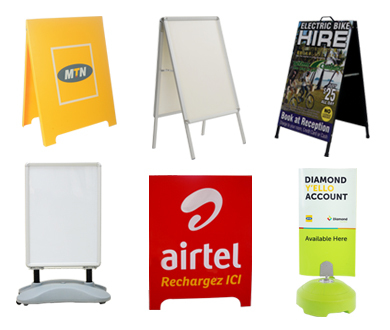 Banner stands ： We offer a huge variety of minimalist, effective banner stand displays. All of these have sturdy construction, high-quality imaging, and a pole that allows for varying heights as you see fit. The graphics can be printed on vinyl or fabric. 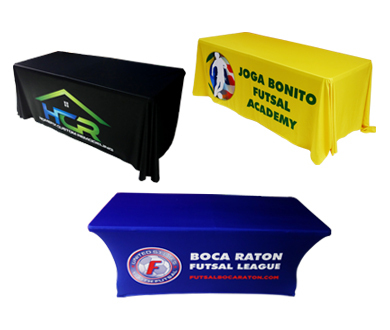 Table throws： Our premium trade show table covers are one of the most popular items in the industry, pairing beautiful with a matching table runner. They are made with 100% polyester twill to eliminate wrinkling almost entirely. These can include logos and can be printed or unprinted with printing methods such as dye sub, screen printing, and vinyl heat transfer to make trade show displays stand out from the crowd. ensuring you’re able to choose the perfect flag for your business. Rectangle Banner Flags: Our most basic feather flag has a true rectangular shape. Teardrop Banner Flags: This flag is a favorite because of its curved lines and swooping look. Bowed Feather Flags: Each flag has a gentle curve at the top, but the bottom can be rounded, straight, curved, and more. 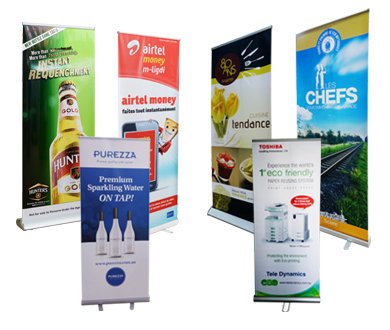 Swooper Banner Flags: The boxy look and minimal width of this feather flag make it perfect for small spaces. 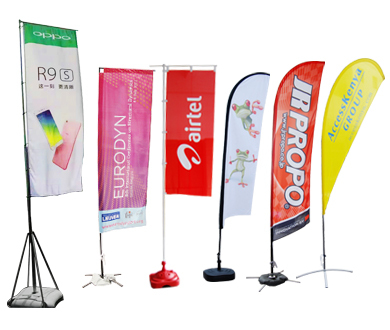 Custom Feather Flags: Also known as curved feather flags, these flags have a true s-shape appearance. 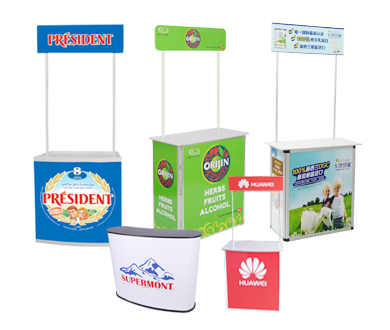 Bsdisplays offer Pop-Up Displays and Stands which immediately catch the viewer’s attention. 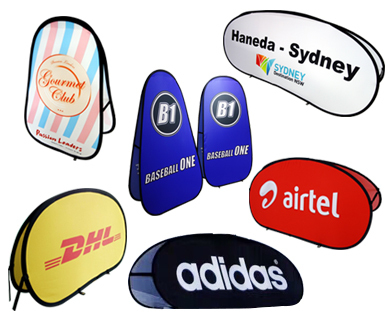 Our High quality fabric pop up displays can increase awareness about your services and help in brand recall. It’s very lightweight which makes it easy for you to carry them anywhere.